No traveller likes to be mistaken for a tourist, and it's much worse for the Americans. 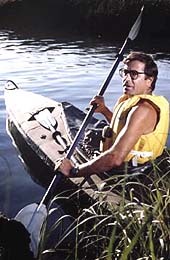 Paul Theroux has been shaped as a writer by the awkwardness of being mistaken for an American tourist. He has exploited it to great advantage, yet the mistake persists. In his superbly fed-up early travel books, The Great Railway Bazaar (1975) and The Old Patagonian Express (1979), he cast himself as an existential hero, setting off to cross the world by train, a prince of travel among the suburban commuters, an heir of Ulysses, much cleverer and more knowledgeable than a mere tourist - which was why it was so excruciating that people kept mistaking him for one. It was the same story in London, where Theroux lived for 30-odd years, and where he has set some of his novels - Half Moon Street (1984), for example, about prostitution in Mayfair. A few years ago he left, apparently no longer able to tolerate, as a distinguished novelist and the godfather of modern travel writing, being constantly mistaken for an American tourist. It was an understandable mistake, though, and one he did little to discourage. After decades of residence, he still looked fresh off the plane, and in his books about England he made all the usual complaints about the climate, the food, the natives. He is now based in Hawaii, the spiritual home of the American tourist, and for his latest book he has returned to Africa, where he started out in the 1960s, "anxious to avoid the draft", teaching with the Peace Corps in Nyasaland. Nearly 40 years later, approaching his 60th birthday, Theroux makes an epic overland journey down the length of the continent, from Cairo to Cape Town, by train, canoe, taxi and bus. Here he is on a bus, explaining the title: "But even though the vehicle resembled a Greyhound Bus and the passengers looked like the people you might find on a long-distance Greyhound, the decent, the hard-pressed, the marginalised, the weird, the aromatic; yet I still felt that I was on another planet, one that bore a striking similarity to the planet earth but was in fact a dark star." To say that Africa is not America is hardly original, and to confuse the latter with the planet is to identify oneself as an American tourist. Theroux is good at complaining, and there is much to complain about in Africa: Aids, poverty, squalor, brutality, landmines, ruined schools and hospitals, expropriated farms. Then there are the "punks" who try to sell him things, the beggars ("I am hungry," says one, "give me money." "I said 'No,' and stepped over him and kept walking. "), and people who want tipping. He dislikes tourists, with the exception of pretty women, and missionaries, with the same exception. There is a rather horrible passage when he lecherously bullies a young missionary, fancying her rotten while calling her a "Christ-bitten nag". Most of all he dislikes aid workers, in their big white cars, "bliss on wheels, courtesy of the First World saps who had been guilt-tripped out their money", never once offering him a lift. Aid, he argues, is self-serving and counter-productive, as it discourages Africans from helping themselves, and aid workers "were, in general, oafish self-dramatizing prigs and often, complete bastards". There are only two groups of people Theroux really likes. One is prostitutes: "I was fascinated by them…Now and then I heard of American or European women's groups whom went to Nairobi and Kampala to encourage prostitutes to get off the streets, to retrain them, 'empower' them…The prostitutes I met would have laughed at such a proposition." The other is Nobel prize-winners - he makes much of his friendships with Naguib Mahfouz in Egypt and Nadine Gordimer in South Africa - with the exception of his old friend and mentor, V S Naipaul, whose character he brilliantly assassinated in Sir Vidia's Shadow (a book that has the same comic dynamic as his travel writing, of rage rebounding on itself) and whom he dismisses here in a few paragraphs: "Naipaul was usually ranting in Uganda, but he wasn't confidently angry, he was afraid, for the source of his rage was insecurity…and as a face-saver he made his timid emotions into contempt when he wrote about Africa." At one point Theroux reflects on the evolution of Homo erectus on the plains of southern Africa, and congratulates himself on his own finely honed survival techniques, such as never going out at night and giving up buses because they're too dangerous: Ecce Homo touristicus. At the end of his trip, at Cape Point, he notices a "teasing headline" in a newspaper: "Pessimistic globetrotter wins Nobel Prize". " 'Looks like I've got the big one,' I murmured…" Not on this form, I'm afraid.